← Who knew? I am a domestic terrorist for taking pictures of farms. My daughter loves to bring home her art projects from daycare – or school, as she calls it – and hold them up to me, saying, “I made that, I made that!” I love to hear the excitement and pride in her voice, and the anticipation in her face to see our reaction to her latest masterpieces. That spirit of pride in making something – and enjoying the benefits of your work – is something that we can easily translate into the food realm with our kids in one simple way: the home garden! A home garden is a fantastic way to share our food roots with children. It doesn’t have to be big or fancy; just a few veggies and/or fruits, suited to what you (or, better yet, your kids) like to eat, is a perfect start. 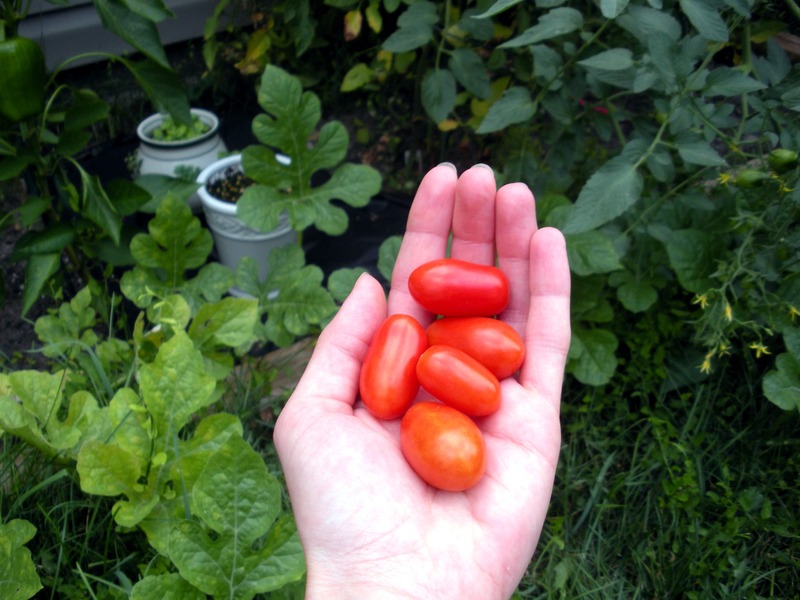 I realized this first-hand last summer, when we decided to grow our first set of vegetables in our backyard. Since this was our first attempt at gardening and I have a notoriously brown thumb, we didn’t want to get too elaborate in case we really messed it up (although we quickly realized there’s very little to “mess up” – just make sure you water regularly, and you’re usually good to go!). We planted a couple of mature tomato plants, green peppers, jalapenos and cilantro, figuring if nothing else, we should be able to create some pretty tasty salsa – which my husband tends to consume in mass quantities, so I realized we might even be saving ourselves some money, too! Each day during the summer, we would head into the backyard to water our little garden. Our daughter would follow us, watching as we filled up the watering can and occasionally “helping” us by digging in the soil a bit with a stick. Eventually, we bought her a child-sized watering can of her own, and she would gleefully watch the clear, cool water shower over the plants as she poured. But the real fun came once the plants starting bearing fruit. 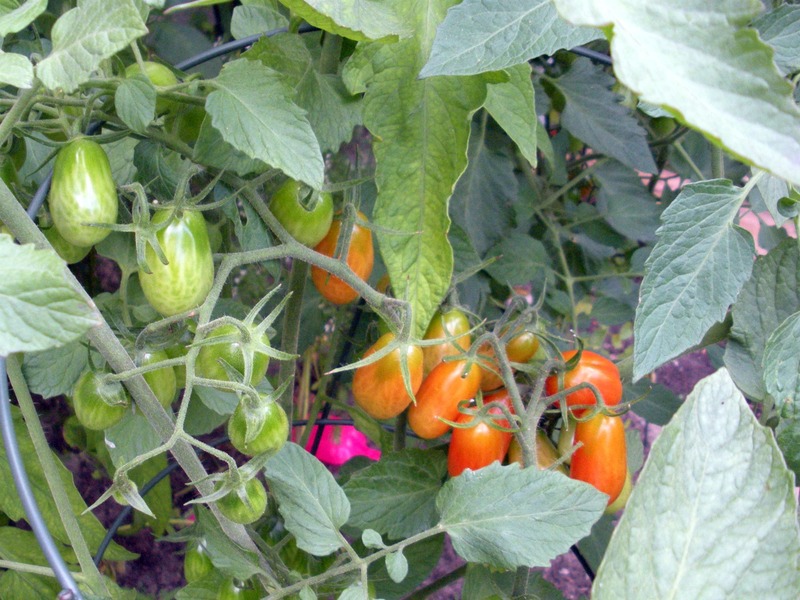 Our daughter has always loved tomatoes – I craved anything tomato-based when I was pregnant with her – so when she realized that there were tiny grape tomatoes sprouting from those tall green plants, it was all we could do to keep her from eating her weight in the bright-red gems! This year, now that she’s a year older and starting to really understand how things grow, I’m looking forward to sharing our gardening experience even more with her – perhaps letting her pick out a plant or two so that it’s truly “her” garden. What are your tips for involving children in the home gardening experience? Any good plants to recommend for our garden this year? I’m all ears! This entry was posted in On the Playground (kids) and tagged food roots, garden, gardening, kate storey, kids, michigan mama, Real Time Farms, tomatoes. Bookmark the permalink.